This was my first brush with vibrant Gujarat, when I and Ekta decided to pay a visit to her mom on her 60th birthday. We took the early morning flight to Ahmadabad and reached there by 8 AM. I must say I was impressed by the Ahmadabad airport, swanky, clean and comfortable; it could give many so called Metro airports a run for their money. The first thing which struck me was the greenery all around. It was the peak of monsoon and Gujarat gave no hint of being a dry, almost desert like place which is the common perception. The second thing was the riot of colors people prefer to wear there, very unlike the white shirt and mundu am used to seeing in Chennai. I got an inkling that this trip was going to be fun and different. 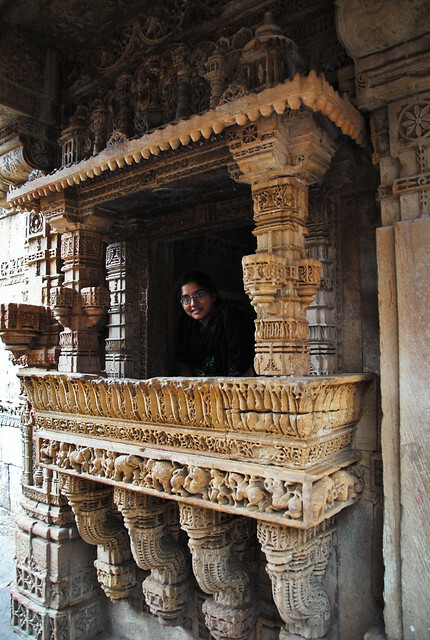 Since we had a few hours in hand we decided to visit Adalaj ni Vav (Adalaj ni Vaav) since EKta wanted to show me the Gujarati architecture of famed step wells. We enquired with local auto drivers, and a gentleman agreed to show the place and drop us in Ahmadabad bus stand for Rs 500. 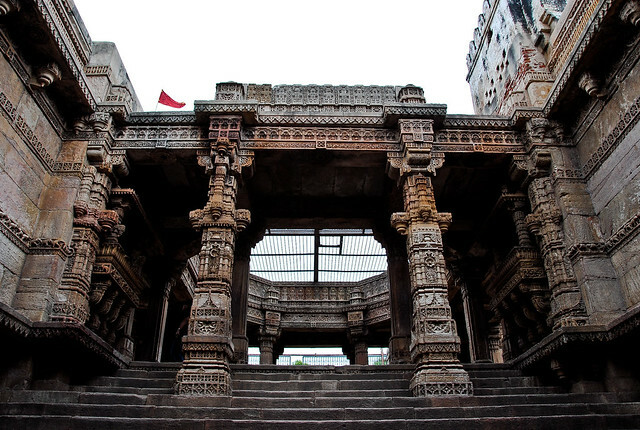 Adalaj is a small town 18 km south of Gandhinagar, primarily famous for its step well. 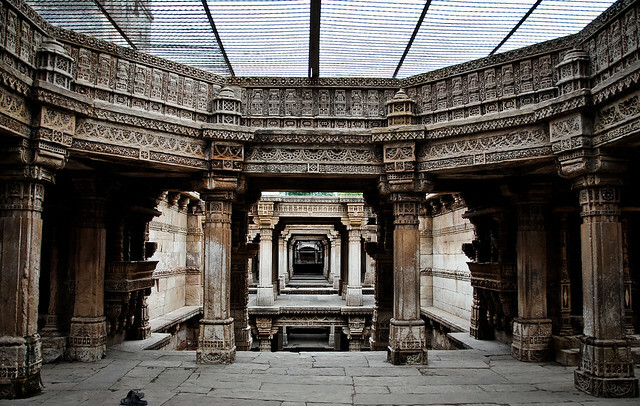 Completed in 1498, this stepwell or ‘vav’ as called in Gujarati is a five storied intricately carved and beautifully designed structure build primarily of stone with the inner parts made of brick and mortar. It is octagonal in at the top, resting over stone pillars intricately carved and keeps going down one beautiful floor after another. From the first story level, which is the topmost in this case, the stairs from three directions go till the bottom level at the fifth floor to the well. The bottom of the well is a square stepped floor in the shape of a funnel opening in the sky above and supported by a maze of pillars and arches. The walls are adorned with stone carvings of women performing daily chores, scenes of court and kings and other fineries. Adalaj, a set on Flickr.